Manufactured in France from 1948 until Circa 1956. I already intend you to say that it is about a box moreover!! Yes, it is indeed of a box, but a different good, because of the boxes like this Midelly, I never yet saw the similar one! Itself is rare. There are three models of Midelly taking again the same general concept, but one and the other was diffused exclusively by Photo Plait, which reduces their propagation considerably. They result from a factory which did not build usually a camera (only parts) what could return skeptic the purchasing potential. Then, the concept is original, because the box made of cast-aluminum is solid and painted of a beautiful black. The finder is not on the top, but on one side. The length of this finder is equal to the depth of the camera, which limits the errors of parallax. The aperture of the back of the camera is unusual, since it is done in two equal parts (see photo). 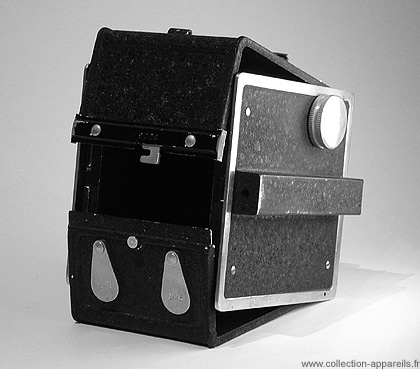 The camera is dual size (6 X 9 and 4 X 6 cm on film 620), and when it is open we see two shutters which make it possible to modify the surface of film to be impressed, which is not without recalling Fex Elite. The model that I have is the standard version, equipped with a meniscus "Boyer". There is a version "de Luxe" with lens "Topaz" Boyer and shutter Gitzo. This version is even rarer than the first. A last precision! 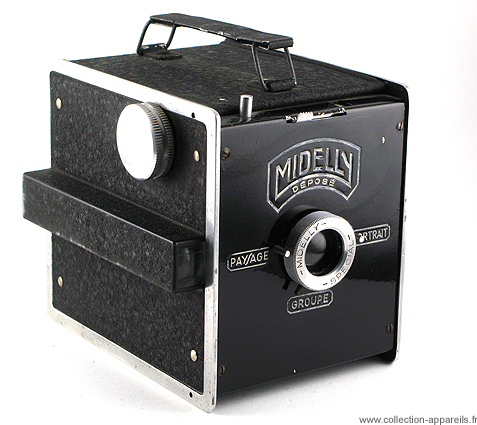 "Midelly" is the name of the model and not that of the factory. This one belonged to Mr. Demilly, whose Midelly is the anagram. The "standard" model was worth in 1952, 3050 francs and the model with Boyer Topaz, 8140 francs . Photo-Plait then recommends this camera to the customers of the Colonies.